Duke of Edinburgh’s Award – In additional to the nine Bronze Badges awarde recently another four pupils have been presented at assembly. Leonie Baptist, Hannah Wood, Gregor Vickerstaff and Sean Quinn have achieved Bronze certificates and badges. Well done to each of them. Recent Success in Art Competition – Congratulations to Arlene Morrison who won a place in Albyn Housing Society’s Art Competition. The theme for the drawings was ‘Life in your community’ and Arlene’s drawing was of a fishing boat, depicting traditional industry in Gairloch. 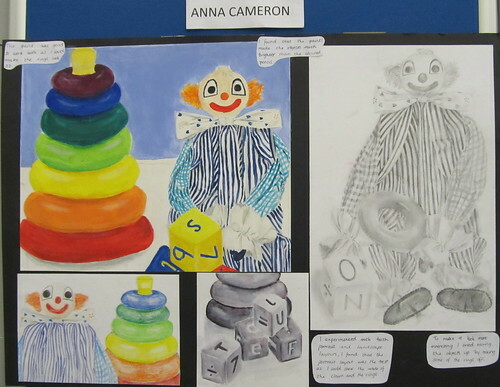 Arlene’s drawing was one of 13 selected from entries across Highland Schools. A generous prize of £50 was awarded to Arlene and £200 for the school, as well as having her drawing printed up in the Albyn Housing Society’s 2016 calendar. The calendar will be distributed widely across Highland. Scottish Malawi Partnership Conference – On Monday 23rd November four pupils (Leonie Baptist, Eilidh MacDonald, Caitlin Mitchell and Jack Wright) travelled down to Glasgow for the day with Dr Caley. They each attended different workshops learning about cultural differences and causes of poverty. The pupils also visited different stalls, learning about fundraising for trips, technology by solar power, Fairtrade and much more. At the end they watched a debate about ‘Do celebrities have an important role in charities?’ In the end the proposing side won, but the opposing side put up a good argument. School Calendar – Our new School Calendar 2016 is now available (£6) to purchase from the school office and other local outlets. It was launched at the opening of the Senior Art Exhibition. We were grateful to Councillor Greene saying a few words and officiating. 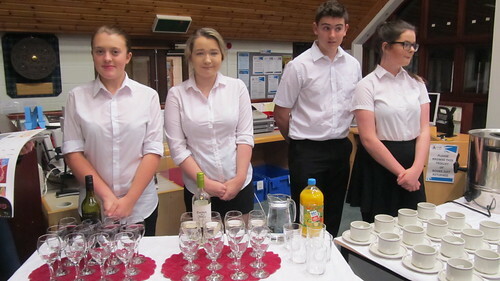 The well-attended event in the library was catered by pupils being assessed for their National 5 Hospitality exam. You can read about this here. We are also grateful to Caitlin Mitchell, Sara Johnston and Joseph Stewart who provided a lovely musical backdrop to proceedings. Thanks to Mrs Browne and Miss Thistlethwaite for organising this successful evening and also to Mrs S Banister for helping prepare the displays for the exhibition which was open to the public until 4th December. S4 Hospitality Event – On Friday 27th November the S4 Hospitality class at Gairloch High School catered for the opening of Mrs Browne’s Art Exhibition, which was held in the school library. St Andrews Geobus – Miss Smith arranged for the Geobus to visit the school again. 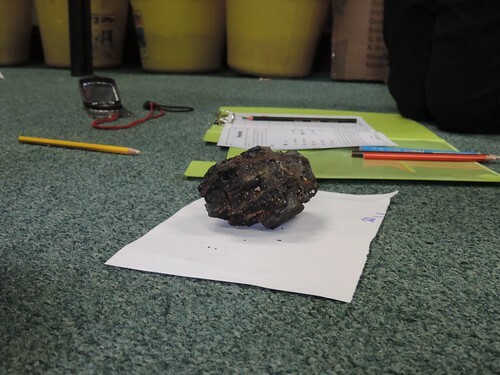 This was another great opportunity for the geography pupils to work with University level geologists. 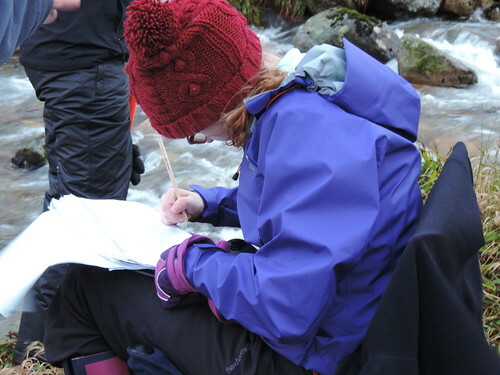 S3 looked at fluvial processes while S4-6 pupils studied geological mapping. One of our S6 pupils also got to study thin sections of local rock under a microscope as part of his geology course. Geography trip to Cairngorms – Working on data collection for their National 5 in Geography, 7 pupils travelled to Aviemore at the end of November to undertake a whole host of fieldwork. They surveyed traffic moving North and South to better understand the impact at different times of the day, studied 3 locations on a river to measure changes as it flows from upper to lower courses, visited Cairngorm Mountain to hear about the impact of mountain activities on the landscape and even managed to fit in some mapping around Aviemore, which we’ve started to add to the OpenStreetMap website. Pupils worked very hard, late into the evening and benefited from taking their learning outdoors where the weather, noise and wet feet cause a whole host of new challenges! Mrs MacRae and Dr Close, four pupils successfully qualified for donation with others requiring to wait until the next visit. It was a valuable experience for all the pupils and we hope that many will continue to understand the importance of donating blood for many years to come. Engineering Science STEM visit – Angela Rae, who works for RJ Mcleod, has been working with the S4 Engineering Science class again this year in her role as STEM ambassador to promote engineering as a possible career path. Angela was sent ten questions set by the class related to engineering and incorporated them into her first presentation. Angela then set two tasks where the pupils had to put themselves in the shoes of a civil engineer. The first task involv ed the pupils producing the road layout for the new Corriemoillie Wind farm and costing the road construction to determine how economic the design is. The second task was a wind farm scenario where Wester Ross Power is planning to construct 10 wind turbines at the top of Achtercairn hill, the pupils have to produce a newsletter which addresses some of the social, environmental and economic concerns the Gairloch residents and local businesses may have. Angela will be taking the class on a site visit to a development early spring. Thank you to Angela for her work with the Engineering Science class and on-going support. Project Trust Support – Dr Close has given a donation of £115 on behalf of the Banff Shooting Syndicate. This money is to be split between Joe Smith and Calum Nelson for their Project Trust fund. 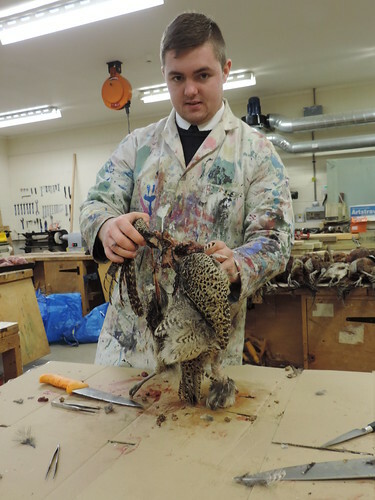 The money was raised by selling pheasants prepared by senior pupils in the school and sold to staff. Thanks to Dr Close for providing the birds so that the Rural Skills students could learn how to pluck and prepare. The birds were sold to school staff who will no doubt enjoy them, with their families, during the coming Christmas festivities. Remember to visit the school website to see more photographs associated with these events. LIKE us on Facebook and you will be kept up to date with the life of the school. Have a great Christmas everyone and thank you for your on-going support of the School! Let’s hope next year is as successful.